I knew I was forgetting something in my last post!! My friend Dan - the one I rescued from ATL today - is getting ready to RIDE HIS BICYCLE ACROSS THE COUNTRY. How amazing is that? We talked a little bit about it today and I wanted to share with y'all a video he put together about it. Does anyone know where the Paper Writing Fairies are? They were supposed to come to my apartment in the middle of the night and finish my paper and they never showed up. So now I'm stuck finishing my paper all by myself. I have almost five pages single spaced - it needs to be 15 double spaced. My friend Dan left today for a week in Europe and had a seven hour layover in Atlanta. I couldn't let him sit in the airport so I picked him up and we spent the afternoon getting lunch and walking around Atlantic Station. He had never been to IKEA before so we walked over and wandered around. His flight left around 5 p.m. ... Traveling Mercies Dan!! Please keep Allen Mullinax and his family in your prayers. Allen is the music director at Pilgrimage. His mom passed away from complications in hip surgery. Please keep Maura LaRocca in your prayers. She is a good friend of mine and my family from Kent and has been suffering from awful kidney stones. The medicines they have been giving her haven't been helping and she is in a lot of pain. That's right - ONE MORE PAPER!! It's due on Friday, which means I need to be cranking out about 7 pages a day between now and then. Totally do-able, right? I definitely have plenty to write about. Tim didn't really give us a prompt to write off of, but most of us are going to be drafting our ordination papers (at least the UCC part of it). I think if I stop thinking of it as an assignment that stands in the way of summer and start thinking about it as part of the journey towards ordination, I may just be able to relax and just let God lead me in my writing. I haven't been as focused on school work as I planned on being (am I ever?) On Friday night Bruce and I stayed awake to supervise the youth sleeping in their cardboard tent city at the 30 Hour Famine and - without technically being able to eat to stay awake - I started reading Mommywood. Once I started I HAD to finish. Luckily, it was a quick read - I finished it on Sunday night!! It was a nice distraction from everything else I have going on. It was a cute book - I was a little disappointed at some of pointed remarks and jabs Tori took at her mother. I know they've had a public and difficult relationship, but I didn't think it was necessarily appropriate for Tori to criticize Candy multiple times a chapter. It's so unfortunate that they can't either: A) Find a way to put the past behind them and get along or B) Just agree to live their own lives and not constantly be harping on each other. Make up or move on. That being said - it's a cute book. I still feel like I relate a lot to Tori - in her quest to be perfect, in her admiration of the people around her and in her long spectrum of emotions. I think I needed to read that after all of the other heavy reading I've done this semester. 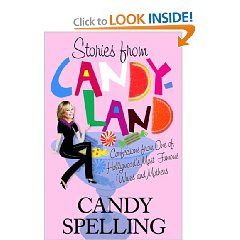 I think I'll read Stories From Candyland next (after I finish my Polity paper, of course ... I think). Bruce and I had a date last night!! It was fun. We were both hungry and tired and NOT in the mood to cook so we went to Chili's and sat in the lounge. We watched the Braves, the Celtics/Bulls playoff game and ended up talking about our honeymoon. I didn't want to talk about the wedding because I thought we both needed a break, but we got on the subject and were smiling and laughing while we were talking, so it didn't seem like such a bad thing. We came home, crawled into bed and looked at hotel options while eating Rita's and watching 27 Dresses. It was a good date!! We haven't booked anything yet, but I think we'll probably make some final decisions tonight or tomorrow!! In the meantime, I'm getting geared up to write my Polity paper so I can bid Seminary Year #2 a fond farewell. Stage #1: Confusion - "Bruce, how did our apartment get this messy?" Stage #2: Frustration - "No, seriously. Bruce, how did our apartment get this messy?" Stage #4: Determination - "Okay, Bruce. For REAL this time. We're going to clean." Stage #5: Hysterical Crying - It's actually kind of hard to get words out at this point. So - I'm in Stage 5 of a Messy Apartment right now. Though, I have to say. As not fun as it is when it starts, it is by far the most effective of the five stages. We're actually making some progress. It's a shame I'm not making any of that progress on either of the two papers I have due this week, but once you hit five the blinders come on and you can do NOTHING else (except blog, apparently). It's strange - as soon as I melted down I immediately wanted my mom. Not to comfort me - to clean. Hmm ... that sounds terrible. I wonder if I can re-word that to not sound like a spoiled princess. Let me say it like this - I was having one of those "I don't wanna grow up" moments. My mom kept such a clean house as I was growing up. My room was always a disaster but once a week I would come home and everything that was once on my floor would be on my bed because she came through with the vacuum and dusted. She did the dishes every night. My father cleaned the floors. She filed the mail as it came in (or at least her piles were neater than mine seem to be). WHY CAN'T I SEEM TO FIGURE THIS OUT?! I want my apartment to be a HOME. Not just a dumping ground or a dust collector. But I haven't figured out how to do that yet without being a nag or without neglecting my responsibilities at work or school. It's SO frustrating. I'm getting married in a little over a month and I can't figure out how to create a home. And that makes me very, very sad. I'm quite literally talking about a nightmare. Like a dream about the wedding where NOTHING was going right. First of all, the wedding wasn't happening in Kent. I couldn't really tell where we were, though I think it was a combination of the church in Washington that my mom used to serve at and the church in West Chester, PA that my cousin got married at over the new year. Anyway - I was in this big room with all of my bridesmaids and there were boxes everywhere and we were getting dressed. Our hair wasn't done because our hairdressers never showed up, but we didn't realize that until right before the ceremony. Oh - and throughout all of this - no one was really happy. We were all just kind of going through the motions. Shouldn't brides and their bridesmaids be chattery and giggly while they are getting ready? Well - we weren't. So I have my dress on and everything is a go when all of a sudden - dum dum dummmmmmm ... We cannot find my veil. I know, tragedy, right? But this was a BIG problem for me in my dream and I started to tear through all of the boxes in order to find my veil. Come to think of it - I think the room we were in looked a lot like my parents basement, dimly lit and filled with boxes (they decided to pay for the wedding before they finished the basement - I affirm this decision). So I'm tearing through boxes and there is NO sign of my veil. I did, however, find my parent's Christmas Tree skirt that they couldn't find last Christmas when they were putting up the tree (Mom - maybe that was my subconscious' way of saying that your tree skirt is in one of your boxes in your basement). So I can't find my veil, the room is now a disaster because I have open and pulled everything out of all of the boxes in it and my hair isn't done. And then people from my church start popping in to say hi. But the ceremony is supposed to start in five minutes. Oh - and at this point Max hadn't showed up. But he finally did and when he walked in the door, I realized that I had never printed a bulletin. In fact - I hadn't even finalized the worship service!!!!! So Max and I are frantically trying to put together the wedding service (this is why pre-marital counseling and rehearsals are VERY important) and Max seems distressed. He looked up and told me that Shannon left him. Now - those of you that know Max know that his wife's name is Liz and they're very happy together. So I don't even know where Shannon came from. Then Max looks at me and says with absolute disgust "I just don't feel like doing this right now." LUCKILY Bruce called (he had left for work before I woke up) and my phone ringing woke me up. When I told him I was so happy he called because I needed to wake up from the wedding nightmare, his response was, "Isn't it too early for you to be having these?" I hope that was the only one!! Am I the luckiest girl or WHAT?! Bruce picked me up from class tonight with these beautiful flowers in the car!!!!! I am SO unbelievably lucky to have a fiance who not only puts up with my stress, anxiety and overall crankiness but also buys me flowers in the middle of all of it!! I actually have a first rough/working draft of my New Testament Final Exegesis. Max read it last night and didn't find anything significant that I needed to change and Edward (my colloquy leader) said he would read it tonight. I'll fix it on Thursday and turn it in on Friday!!!!! The Army Wives are BACK!!!!! Can y'all tell I am just ITCHING for school to be over? Memoirs written by perky blondes, a new season of my favorite Lifetime television series ... I am officially ready to be finished with my to-do list!! ... my "post - second year" reading list is on its way!! Mommywood is Tori's second memoir. The first one was light and adorable and made her not only a relatable celebrity, but also helped me realize that I'm not the only person who is highly emotional, extremely passionate and at-times completely irrational. I promise I am NOT trying to play both sides in the whole Tori vs. Candy battle, but I am curious about what it was like to marry into such a dynasty and to have to deal with being a celebrity through marriage. I have Sarah Weddle to thank for this book - she sent me a link with an excerpt from it last week and I was instantly hooked. I had NO idea she even had a book deal!! Kristin Chenoweth is potentially one of the most adorable and down to earth actresses I've ever followed. If I could be as adorable and put together as she is every time I see her on TV, I would consider myself to be lucky. I'm looking forward to seeing what she has to say about life, love and faith in stages - the topics that I tend to blog about!! Notice that NOT ONE of these books is exegetical, methods of exegesis, biblical interpretation, readings from early Christianity, congregational analysis, etc. etc. etc. Don't get me wrong - I love what I'm studying. But I'm ready to cleanse my mind and read something a little bit lighter. In the meantime - I'm working through my finals to-do list. If I were to show you the list again, it would appear that I've gotten nowhere, but I promise I have. I've been working at my exegesis all day and have a thesis and an outline. I've also been having had an ongoing conversation with Max about my thesis and the direction its heading. We appear to be on the same page and he agrees with my thesis so I hope to keep moving in a forward direction!! I'm actually REALLY happy that I chose the passage that I chose to exegete. I chose Luke 23:32-49 - the death narrative. In once sense, its kind of a depressing end to the semester, but we had already touched on part of this passage once in a colloquy paper and I left colloquy that day wishing I had a second jab at the assignment. This is my second jab!! It's also amazing to me how some of the pieces of the semester are starting to come together (we've looked at different types of criticism in pieces) and how they interact with what we learned in NT501. I'm really happy about that - I've been frustrated with my New Testament experience and I'm hoping this paper will help me end it on a positive note. SIDE NOTE: Tomorrow is the Baked Potato & Salad Fundraiser for the youth at church - did you know you can get a 50 POUND BOX of potatoes at the farmer's market for $20?! ... five to go!! Papers, that is. I handed in my NonProfit final project today, as well as my second to last New Testament colloquy paper. I'm SO close to being done!! I think Bruce and I might take a weekend trip down to Ormond Beach to visit Jen and Tim after I finish and I can almost smell the salt water of the ocean, feel the sand in my feet and hands and breath in the warm beach air. Almost. The past couple of days have been trying and tiring. My NonProfit project ended up being close to 50 pages and I still think there was more we could have done. I've realize through this project that my enthusiasm for programming, fundraising and advocacy is strong, but I despise the paperwork side of it. I would be thrilled if I never had to fill out another Form 1023 again. The strange thing is that on Monday night I walked into Polity completely frazzled about forming any NonProfit (including new church starts) and the topic that night was New Church Starts. How ironic? I came outright and said the paperwork kind of terrified me, but Cameron Trimble, Associate Conference Minister for Church Development of the Southeast Conference of the UCC, came to talk to us and her enthusiasm was contagious. Cameron showed us frightening statistics concerning church decline and she emphasized the importance not only of new church developers, but also developers in the northeast that can bridge the gap between the rich history of the northeast and the potential of the southeast. My friend Dave and I were talking after class and he pushed me towards thinking about ME being that bridge. We had joked about it during class, but wanted me to consider it seriously. I love so much about the northeast, but the church needs to be revitalized with new energy and emphasis on partnering with younger churches in areas of the country where the UCC is less prominent. Anyway, for the time being, I'm taking the night off from school work. I don't have anything due for a week, so nothing is so urgent that I need to be sitting at my desk cramming tonight. Bruce and I have had a relaxing evening so far. We cleaned up a little bit and then one of Bruce's co-workers came over and brought her puppy!! He's adorable - 14 weeks old - but she's not sure if she's going to be able to keep him. Bruce and I are talking about taking him, but he's going to be HUGE and we really aren't sure we're comfortable keeping a dog that big in an apartment our size. I'm not sure it's fair. Anyway, we're still talking about it. Alicia came over so we could meet him, introduce him to Lilly and see how he acted in our apartment. He is quite possible one of the cutest dogs I've ever met. Alicia's not sure if she will be able to part with him, so we're just going to keep the conversation going. Lilly wasn't actually as terrified/mad as I thought she would be so it's nice to know that the option is open. I know that taking the time to think about it will allow us to make the right decision. That's all for now - here is a picture of the puppy (so you can see why I'm having a hard time resisting!!) ... He's a lab mutt - with what we think is a terrier mix. His coat is SO soft and his eyes are so beautiful they just make me want to cry. I so wish we had a house with a big yard, but I feel like we'll make the right decision. Just not tonight. To all my Emory friends - Good luck going into finals!!!!! I have 35 pages of Form 1023's, budgets, mission statements, bylaws, fundraising plans, staffing structures, board compositions, tools for evaluation and more due Wednesday at 5 p.m.
And a New Testament colloquy paper due that morning. 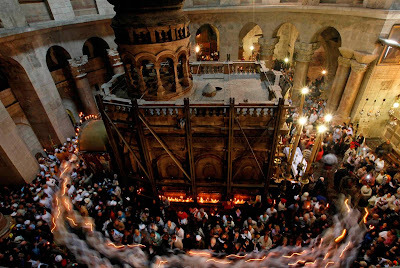 Catholic pilgrims and clergymen hold candles as they walk in procession around the tomb traditionally believed to be the site of the crucifixion and burial of Jesus Christ, during the Easter mass in the Church of the Holy Sepulchre, in Jerusalem's Old City, Sunday April 12. Wishing you happiness and blessings on this beautiful Easter day!! I know what you're thinking - why not both? Here's some background on my thought process. 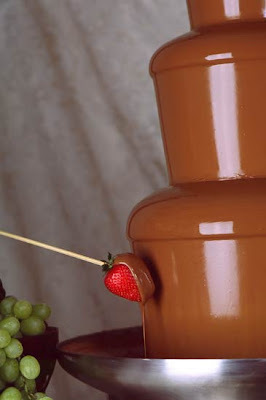 I had originally wanted a chocolate fountain, something that we haven't completely ruled out yet. But my sister and mom and I are aware of the fact that we would have to buy/rent the chocolate fountain, the caterers would have to prep the chocolate in advance, and someone would need to make sure that people are being careful around the fountain itself all the while needing the fountain to be accessible to everybody to get to. Oi!! Meanwhile, I've been browsing through wedding websites, catalogues and blogs and have been introduced to the idea of candy buffets - simple and sweet!! You don't get the elegance of chocolate cascading down a fountain, but it seems simpler and just as delicious. 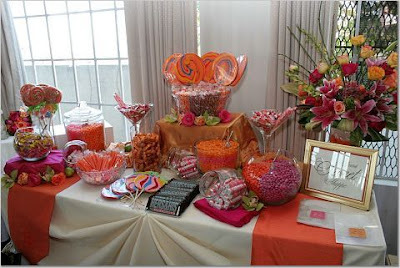 Sweet and Simple Candy Buffet? Elegant and Classic Chocolate Fountain? Congratulations to the UCONN Women's Basketball team on a PERFECT SEASON & NATIONAL CHAMPIONSHIP!!!!! Beth Jenkins, my former high school teacher and All School Musical Producer, died yesterday of ALS (Lou Gehrig's disease). She was diagnosed when I was in high school - and taught for as long as she could. I have so much respect for her - for having a passion for literature and theater, for letting her students express themselves, for not letting an illness define who she was, for teaching when it didn't come easy and for loving life up until the very end. 5,600 people in the United States are diagnosed with ALS every year. From the time of diagnosis, the life expectancy for the individual is two to five years. For more information on what you can do to support the fight against it, go here. I got to video chat with my favorite soldier today!! Granted - there was a lot of delay and it kept cutting out and we really only got to video chat for three minutes, but it made my day nonetheless. This is one of the pictures Neal sent me - he's been able to treat a lot of Iraqis, which I think is his favorite part of the job. I love looking through all of the pictures he sends because I love to watch people do what they've been called to do. It's beautiful, it really is. I would love to post all of the pictures, but I don't want to post any that show faces. If you're interested in reading more about Neal's mission, I would encourage you to read this article. Never in my wildest dreams did I ever think that I would be so proud of our military personnel. I'm not a pacifist, but I'm an idealist - there has to be a better way, right? But from the day Neal told me he was joining the army, he's helped me separate the soldier from the war and pray for peace, but also for safety. For those of you who oppose this war, I would encourage you to find a way to be involved with the soldiers and the families who are left behind. Supporting the soldier does not support the war. I have found solace in this. I was having one of those yesterday. There was no reason for it to be one of those days - it was Friday after all!! Two classes and a few hours of work stood between me and the weekend. And I even felt prepared for both classes. I was preaching in my colloquy and my sermon had been finished since lunchtime on Thursday and the paper topic for New Testament this week was something LTJ had spent a lot of time on last semester. So I'm not really sure what happened. I think it started with my sermon. It's not that it went badly or anything, it's just that it was a really difficult text and in my search for answers or that big "ah-ha!!" sometimes I think people are looking for in a sermon, I touched on too much and didn't just the let hard questions sit. Don't get me wrong - it wasn't a terrible sermon, I think I was just trying to hard to find answers and not listening to God tell me that sometimes unanswered questions are okay. Anyway, I went to my New Testament colloquy fairly confident with what I had gotten out of this week's response paper and left feeling like I really don't belong in seminary. I'm not really sure what happened - I tried to express my understanding of Paul's letter and it came out sounding like I've never opened a bible in my entire life. Perhaps I'm exaggerating, but it's how I felt nonetheless. I didn't go to Eucharist, I decided to go straight to work. I probably should have gone to Eucharist - I'm continually amazed at the way God can work through someone when they least expect it - but I just didn't feel like I could prepare myself for worship. When I got to work a girl who was a work study student last year was visiting. She graduated last year and now works down the street and her main purpose being there was to interview students with a group of people she works with for an internship. Her job is amazing and I'm fairly certain she's getting paid well. She's doing something that is challenging to her and letting her use what she learned in school. She was wearing a power suit and had these fierce Prada glasses on. I am jealous? Not in so many words. Am I frustrated that I'm still in school, without the money (or any reason to) purchase suits or cute business attire? Am I frustrated that I'm working out of my field & call for $12 an hour? Am I frustrated that this job gets in the way of my school work? Am I frustrated in this "in-between-time" between parishioner and pastor? Do I feel like I'm getting nothing accomplished and not being effective anywhere? Yes-Yes-Yes-Yes-Yes. It was just a reminder that I'm stuck in a holding pattern and the pilot won't let me off the plane. So - jealous? No. Frustrated? ABSOLUTELY. So now I'm at work, feeling like I'm theologically inadequate and frustrated about where I am in life. And I have a giant pile of data reconciliation that needs to be done. Now - I try not to complain about what I do at work. I'm SO grateful for my job and love the people that I work with. It's just that I really do not like data reconciliation. I didn't like it when I had to do it at Sportography (sorry Court and Mario!!) and I don't like doing it now. I don't understand why we can't just get the data right to begin with!! But anyway, I had this big pile of data reconciliation to do and it just made my down mood spiral even further. I decided to leave work around 4 and took the scooter, which had been at Emory since Tuesday. I hadn't planned very well, because when I left in the morning I wasn't thinking that I would be riding the scooter home and had nothing to protect me from the wind. You'd be surprised how cold one can get when you hit 45 mph on a scooter and the wind is blowing you around a little bit. So I got home - cold and down on my life. A wonderfully soft Easter bunny/bear!! I've been hugging it since I got my hands on it. 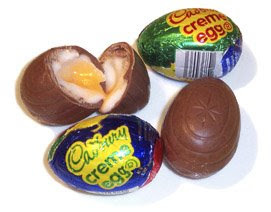 He also brought me Cadbury Cream Eggs and a new pair of earrings!! How lucky am I? He knew I had been having a hard time and just wanted to me to feel better about myself and about life. I accidentally read the nutrition information on them and they're not as unhealthy for you as one might think!! So I think I'll have two!! I've been trying to focus today on my NonProfit Leadership final project. My friend Moses and I are creating our own 501(c)3 - actually we're just working through the motions, we're not actually going to file anything - and it's due in just over two weeks!!!!! There's lots to be done, but it's a creative project and I've really been enjoying it. I just wish I didn't have so many other things going on and I could just focus on that (I feel like I'm saying that about everything these days!!). Anyway, here's a preview of what I've been working on - we have to create a template of our website homepage and this is what I came up with. Please let me know if I should change or add anything. Think about it this way - when you go to a nonprofit homepage, what are you looking for? Does this look easy to maneuver? Should I add and/or remove anything? I would love your comments! !